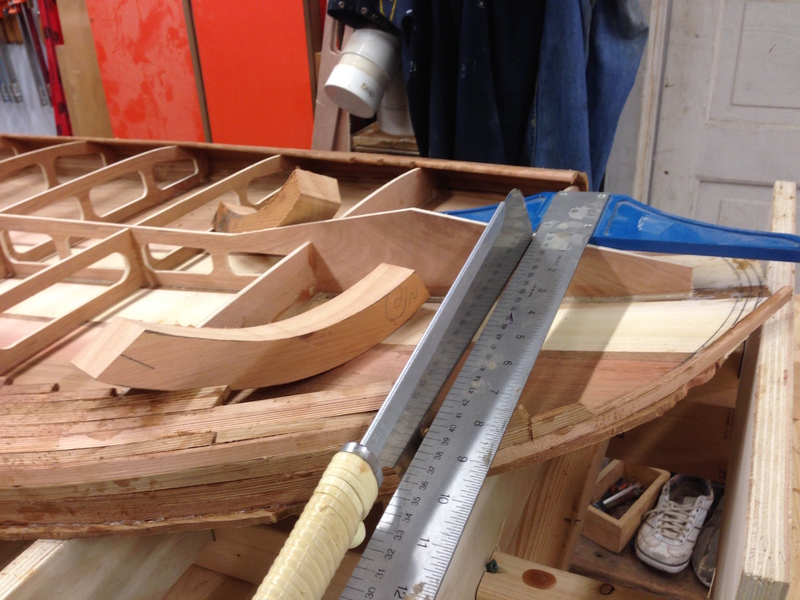 The next step in building a hollow wood paddleboard is installing blocking. The nose and tail blocking can really add to the look of the finished board if done correctly. I will detail in this post how I tie in the strip-feather-rail constructing with ascetically pleasing solid blocking. 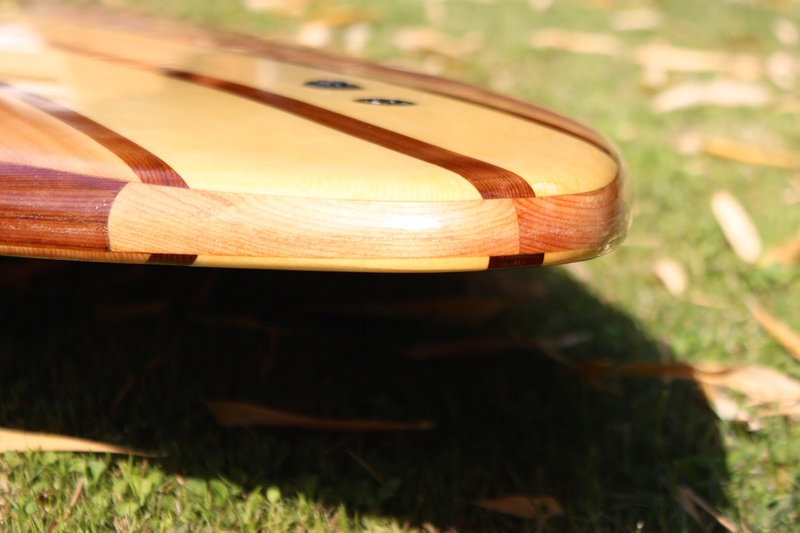 The result is a board that is lightweight with solid “bumpers” at the nose and tail. 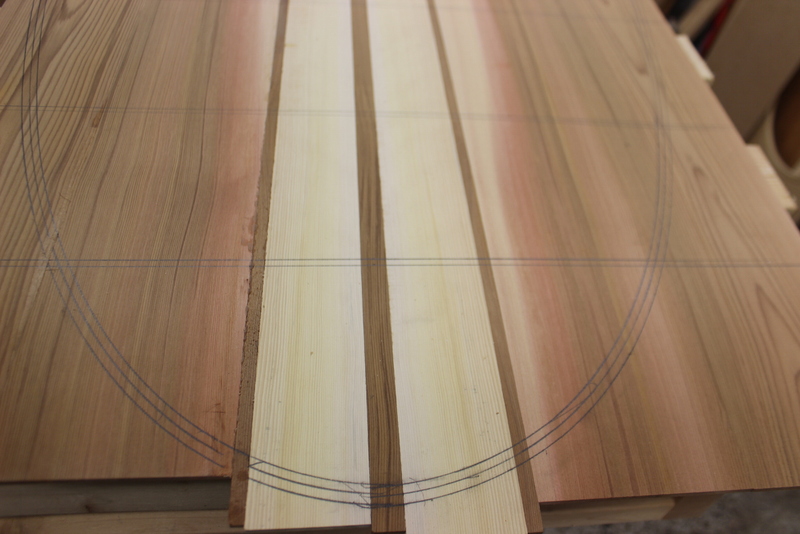 The tail of this board is simple, strong, and ascetically pleasing with the nice matching grain. Start with a good outline of the finished shape. 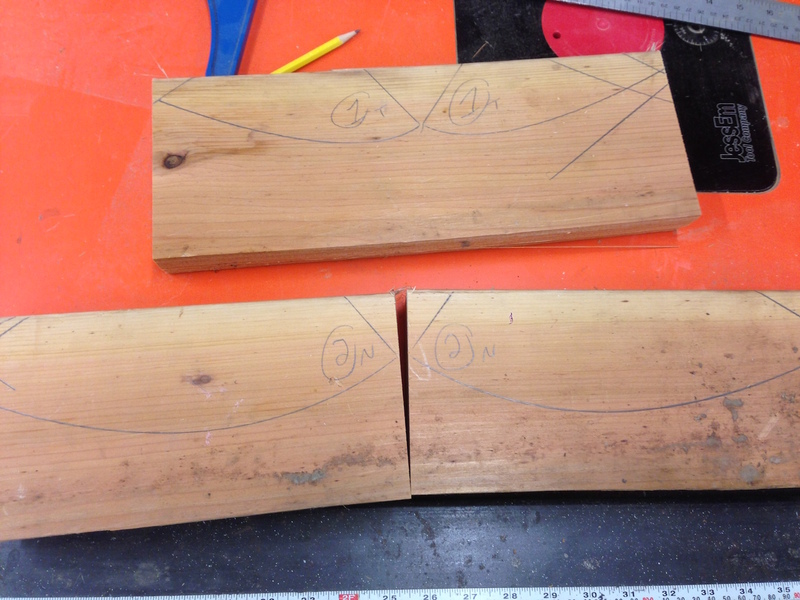 Draw two parallel lines around the bottom plank of your board since one is covered with your starting strip. Tip: Use a washer with your pencil inside the hole to trace your outline template. Follow the inside line to insure with your first strip to ensure you have a nice fair outline. Leave the strips long so the extra can be used as a lever. Tip: Steam the last bit but you don’t have to stress past the last rib since we are cutting it off later. Follow the outline as far as you can then secure it in place. 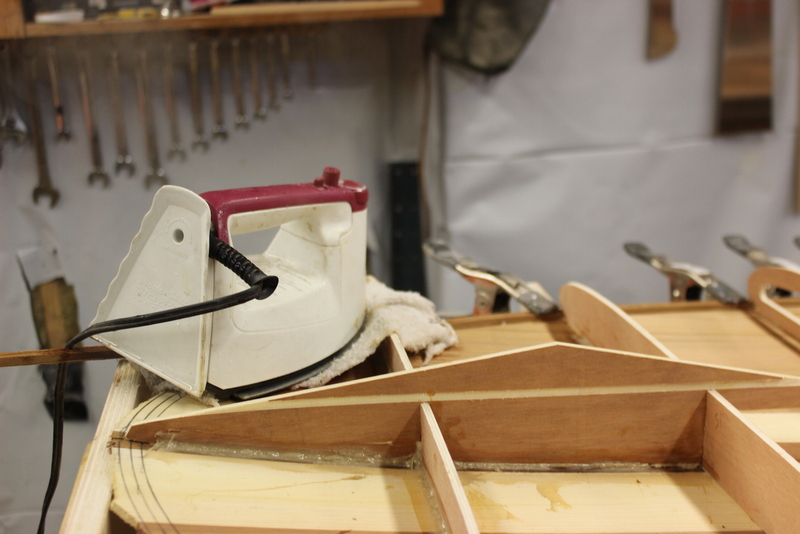 i use a nail in the rocker table to hold the excess so I can trim the excess off and repeat on the other side. Finish the rails. Figure out on your board where you no longer were able to follow your outline. This is the minimum size of the solid blocking. Use your outline template to layout blocking. 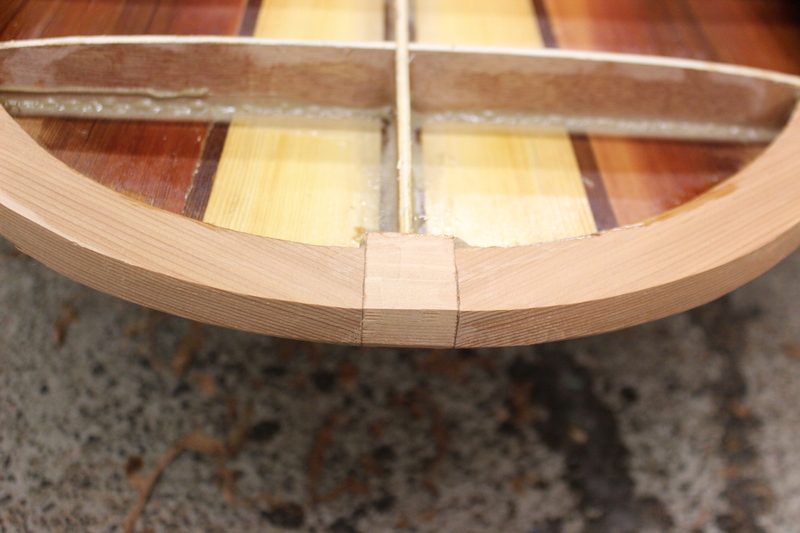 Tip: It is really important that both sides of the front and the back come from the same piece of wood. If the grain doesn’t match the board will look unbalanced. Cut out the solid blocking. 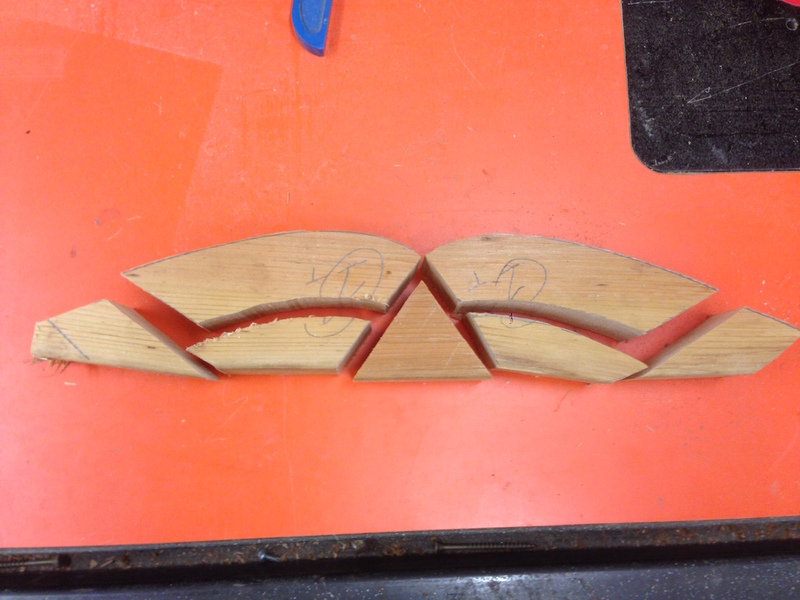 The 2 large pieces above are the tail blocking. You can see here how the grain matches as it wraps around the board. The triangle that is removed is the key to having the grain to appear like it wraps around the nose or tail. Here is a more detailed tutorial on laying out blocking. 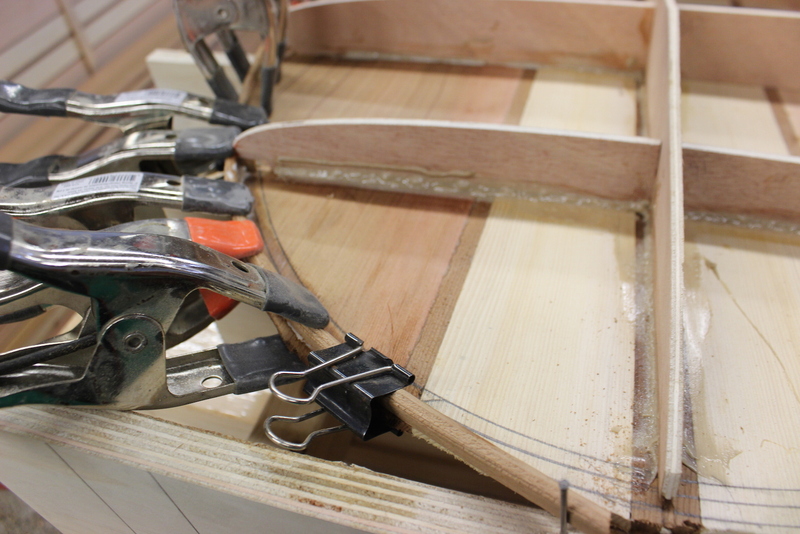 Use a square or straight edge to cut off the side rails just a smidgen longer than you want. 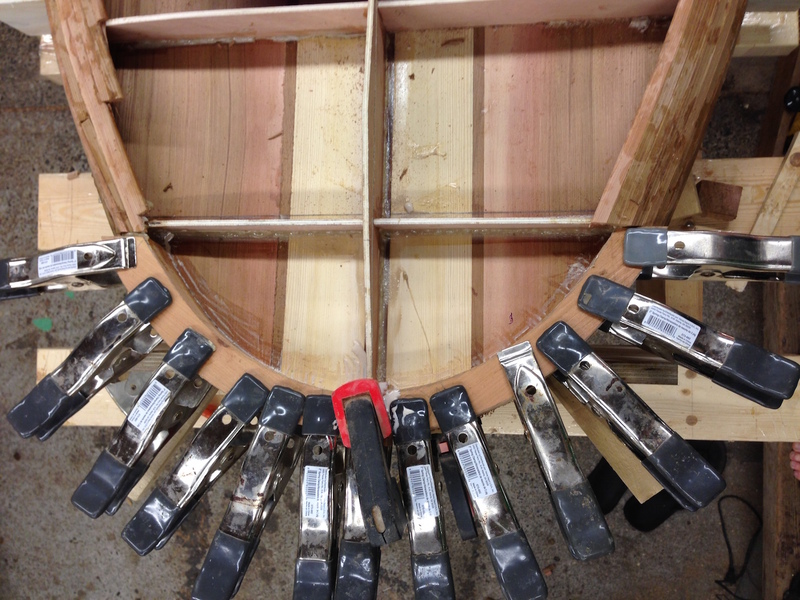 You can then use the solid block as a saw guide to get a perfect fit. The tip of the framework is also trimmed to allow the blocking to meet at the centre. Note: The gap that shows on the left is above what is going to be removed. Remove the excess material in preparation for the top. Note: You can get creative with the blocking but I try not to line up with details on the top and bottom planks. If things shift even a little bit when clamping on the top it looks horrible.